Those of you who read this blog on a regular basis know that I consider Different Worlds magazine to be one of the great publications of what James Maliszewski calls the Golden Age of D&D. The magazine ran from 1979 to 1987. It was initially published by Chaosium, then by Sleuth Publications, and finally by Different Worlds Publications. Two of those companies are still around today, and one is going very strong. I was particularly impressed with Different Worlds' famously reprinted issue 23. That issue was a "Special Superhero Issue" that contained articles by the designers of CHAMPIONS, VILLAINS & VIGILANTES, SUPERGAME, SUPERWORLD, and SUPERHERO 2044. That's right, the designers of all the major superhero rpgs of the time had an article in that issue. 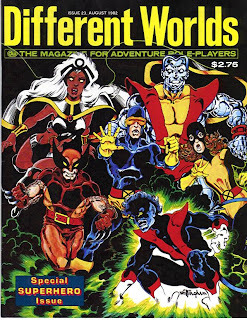 Add to this a cover illustrated by Bill Willingham and stats for the X-men in three different game systems (V&V, Champions, and Superworld) by the game designers, and you have a truly special magazine issue. I would argue that it is the single best issue of a gaming magazine published to date. The success of this issue led Tadashi Ehara -- the magazine's editor -- do make the Special Superhero issue a somewhat regular feature, and a year later with issue 30 in September of 1983 the magazine had a special "New Teen Titans" issue. This issue provides statistics for the New Teen Titans -- Nightwing and crew, though he's still Robin at the time -- for CHAMPIONS, VILLAINS & VIGILANTES, and SUPERWORLD. Three systems that each handle super powers differently, but that are all workable systems. The statistical representation of the characters, all done by the system designers, reveal interesting things about the rules themselves. This is especially true for the character of Changeling. As a shape shifter, his powers are a challenge to emulate. How do you design a character who can become any animal? It's a difficult design question, but one that comes up from time to time in the comics. It is also a question that eventually led CHAMPIONS to adopt the "Multiform" power, a solution that I've never been fond of. Starting with CHAMPIONS, the character of Changeling is represented as a relatively normal heroic character in his base statistics, but has all of his shapechanging powers in a single 200 point multipower with all of his abilities represented as variable "multi" slots. It goes on like that to include a number of possible power combinations. It's a solution, but one that isn't much better than the "multiform" solution later implemented. I have always liked the use of a multipower in order to simulate this kind of ability, but I prefer one of two options not presented by Steve Peterson here. First would be the each "animal" is a different "ultra" slot in a multipower. Thus Gorilla would be one slot and Monkey another. The other way would be to have several multipowers. One for offensive abilities, a second for defensive, a third for movement, and a fourth for "variable senses and options." Any of these can work, but as you can see any version also requires a lot of work by the player to get what they want. Steve Perrin's SUPERWORLD adaptation was to just give Changeling all of the powers -- heightened strength, shrinking, growth, armor, movement, etc. each with a conditional use modifier of "only in certain shapes." This is followed by a list of shapes that Changeling can assume: man, bear, cat, bird, canine, snake, elephant, octopus, and so on. Any animal that he has listed, he can become. And the GM and player can discuss which powers are appropriate to the form. This is a pretty good solution, but it also requires bookkeeping with regard to building and then maximizing each form. TRANSFORMATION (Shapeshifter/Creatures): PR for each change equals the square root of the number of Basic Hits possessed by the new form assumed. Any shape having over 20 Basic Hits cannot be maintained for more than 11 turns. Smaller shapes have no time limit. Only creature/animal shapes may be assumed, including intelligent non-human species, but he must be familiar with the creature to copy its shape. That's it. Leaving the player and GM to design each and every animal the player can turn in to. Other than having to design a lot of animal stats, this is a pretty nice adaptation. It is also one that Herman had to invent as the power isn't in the rulebook. That's the nature of V&V though. House rules rule the day. 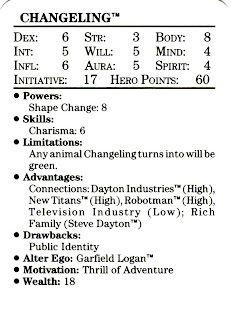 When the DC Heroes RPG eventually came out, they represented Changeling in the following way. I am a big fan of the DC Heroes solution. It is similar to Herman's, but balanced by being a very expensive power to have at high levels, though inexpensive enough for a starting character to purchase it. It limits abilities to existing animals, and many can be found in the appendix. Like all of the options though, it does require a player to have a number of character sheets at the ready to represent Changeling in multiple forms. I think it is interesting how the different games each approached the design challenge that a shape changing character brings. I don't know that any has a perfect solution. I like DC Heroes' solution, but only because their underlying AP rules structure means that each numerical value has a very specific meaning.